A LUTTERWORTH football club has been given the go-ahead to move to a new ground left vacant a year ago. Lutterworth Town Football Club had applied to Harborough District Council for a licence to play its home matches at the Dunley Way football ground. The club has been playing home fixtures at the Coventry Road recreation ground since the start of last season – but had to be given special dispensation from the Leicestershire Senior League because the rec did not meet the league’s minimum standards relating to pitch-side fencing. The district council gave Lutterworth Town FC the green light for a five-year licence at a meeting in late April. The licence only allows Town to use the Dunley Way pitch and changing facilities, not the clubroom and other facilities at the clubhouse at the recreation ground. In the report considered at the meeting in April, the council said: “The issue of a licence for Lutterworth Town to use the ground for football will require the district douncil to continue to maintain the site in a condition fit for public use. “Grass cutting will take place at fortnightly intervals and boundary structures and trees will be maintained by the district council. “This equates to an approximate cost to the council of £4,600 from the grounds maintenance contract budget not including day works. The Dunley Way ground was the former home of Lutterworth Athletic FC. Athletic had been granted a 12-year licence to use the site in 2005 – but the club encountered problems when it was unable to win planning permission for floodlights at the Dunley Way ground. At the time, Athletic said that without the floodlights the club was failing to meet certain league standards and faced losing out on cash grants from the FA which would have placed the club in jeopardy. Athletic’s floodlighting issues were resolved when it sealed a move to Hall Park, adjacent to Lutterworth Soccer Centre in Hall Lane, Lutterworth Town FC’s former home. That move, however, left Lutterworth Town without a home ground and meant the club had to play at the Coventry Road recreation ground this season. Athletic has since completely vacated Dunley Way, leaving the ground vacant for Lutterworth Town’s application. 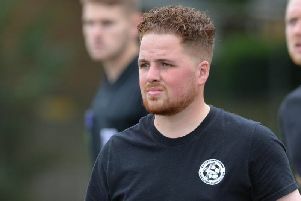 The two clubs have had very different fortunes since the ground switches last season – Lutterworth Athletic have won promotion to the East Midlands League from the Leicestershire Senior League while Lutterworth Town have finished second from bottom in the Senior League’s division one.